Massapequa High School (Massapequa, NY). 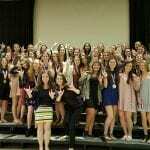 Massapequa High School encourages staff members to learn from one another. For instance, currently the teachers participate in a “Pineapple Chart” process where they open-up their classrooms, announce lesson subjects via a posting board, and welcome colleagues to visit. These activities impact students as they witness staff professional growth efforts, and ultimately benefit from enhanced classroom practices. Successful technology integration is the result of targeted and sustained professional development. Understanding teachers and students need assistance in their use of instructional technology, the school committed to ensuring access to many levels of technology assistance. A dedicated Technology Learning Coach (TLC) meets with individual teachers, groups of teachers, and curriculum departments on a daily basis. Using open appointment slots on a shared Google calendar, teachers are free to book time with the TLC when interested in learning how to integrate specific tools. The coach also leads instructional sessions during professional development periods. In addition, teachers are invited to attend Model Schools technology sessions that are offered after school. Fishing Cove Elementary School (North Kingstown, RI). At Fishing Cove, professional development addresses student behavior, both inside and outside of school. Two years ago, the school dedicated a large amount of professional development funds to train every teacher, teacher assistant, and all specialist educators in Open Circle. This training increased the school’s capacity to support students’ regulation of their behavior and solve problems. Teachers attended multiple days of training, incorporated the strategies into their classrooms, and received one-on-one mentoring from Open Circle in their classrooms to solidify their instructional practices. When this training yielded positive results throughout the school, teachers requested more. The Center for Resilience visited the school to coach teachers on how to use mindfulness techniques in the classrooms. Grades 1 and 2 teachers found the training so helpful that their professional growth goals now center on this topic. Each month, they share new mindfulness strategies at the monthly staff meetings. The Rhode Island Healthy Schools Initiative funded a comprehensive Playworks training focused on positive student activities and interactions during recess. The Fishing Cove Playworks Team continues to attend training sessions to increase student engagement on the playground. Grove Valley Elementary (Edmond, OK). As the lowest in General Fund funding of any school district in Oklahoma, Grove Valley must be very creative and purposeful when it comes to professional development. Each week, the faculty meets for Late Start Wednesday – a district-designated one-hour time slot. During this time, teachers participate in Professional Learning Communities and review student data, develop common assessments, share feedback about What I Need (W.I.N.) time, and discuss Instructional Round presentations. The principal conducts “Virtual Instructional Rounds” through classroom walkthroughs and videotapes examples of best instructional practices. Other Instructional Rounds include one team of teachers observing other teachers in the building for approximately twenty minutes. The Grove Valley Instructional Framework guides the identification of best pedagogical practices in the classrooms. Teachers are videoing effective practices they observe while on Instructional Rounds and sharing during Late Start PLC’s. Also, during this time, teachers provide short presentations delivering information on Marzano’s 41 elements of most effective teaching strategies. In addition, the school has two Swivls, which is a robotic platform used for recording presentations or class lectures. Teachers connect these to their iPads and use a Swivl app to video themselves teaching. These videos can be used for self-reflection and growth. Teachers share their videos during Late Starts to create dialogue about strategies that are working well with their students. The result of the building embedded professional development has been powerful and positive. Teacher evaluations continue to improve across the building. Since implementation, teachers have become more collaborative, and the school credits the rise of our student test scores to this. Teacher retention has also improved. 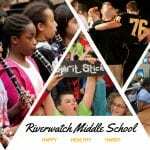 Riverwatch Middle School (Suwanee, GA). Each school year, the Riverwatch Professional Development Plan supports goals outlined by the School Improvement Plan. The goals are based on a variety of data points, including standardized test scores, College and Career Readiness Performance Index (CCRPI) ratings, Student Health Surveys, and Teacher Keys Effectiveness System (TKES) ratings. From this data, teachers and administrators develop a CCRPI Goal, Academic/Instructional Goal, and Climate Goal. These objectives then serve as the guiding principles behind the annual professional development plan. Since, Georgia Milestones data indicated a need for greater focus on writing instruction across explanatory and argumentative genres, a portion of the professional development plan was devoted to training Enrichment and Social Studies teachers in Data-Based-Questioning. Similarly, data from the Student Health Survey showed students were struggling with connecting with adults at school, anxiety, and peer relations. Based on the research of character education programs, Riverwatch trained staff on Habitudes, a youth leadership curriculum. Based on the TKES ratings data, staff needed further professional development on the standards of Assessment Strategies and Assessment Uses, so Riverswatch provided both workshops and targeted observation feedback. These targeted efforts, based on data from a variety of sources, have impacted teacher practices, student writing performance, and student character development. 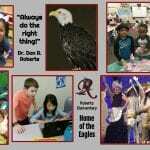 Don Roberts Elementary School (Little Rock, AR). The Don Roberts Elementary School is home to an award winning Environmental and Spatial Technology (E.A.S.T.) Lab. The EAST Lab provides professional-grade technology for students to learn to solve problems creatively in their communities. Students have access to state-of-the-art software and equipment: drones, geospatial technology, 3D printers, graphics programs, small computers for programming, and video editing software. The Roberts EAST lab serves over 100 students in grades 3-5. Students master the software and tools in project-based activities and projects. One of the most dynamic student project is the development of a 3D yearbook for the Arkansas School for the Blind and Visually Impaired. Through the magic of “Sense Scanning,” Roberts’ students scan the faces of each graduating senior of the Arkansas School for the Blind to create a 3D yearbook. The 3D yearbook provides students with visual impairments the opportunity to feel the facial features of their classmates. Leon Sheffield Magnet Elementary School (Decatur, AL). At Leon Sheffield Magnet Elementary School, students not only have access to STEM in their classes, but each class visits the STEM lab weekly for forty-five minutes. In the STEM lab, students commonly work in teams to apply their knowledge by solving problems or conducting experiments. For example, third graders learned about chemical reactions and designed their own experiments. Fourth graders built a flood barrier to keep a tiny doghouse from flooding when it rains. The students also research, organize, and present group and individual science experiments. The technology class extends the students’ ability to use data and research to present information. Students learn work-place skills in how they present ideas, research, and information in word processing documents or visual organizers. AcadeMir Charter School West (Miami, FL). 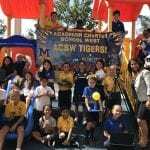 The mission of AcadeMir Charter School is to provide a challenging academic curriculum that includes an enriched STEM project-based learning program for students in grades K-5. AcadeMir extended the school day by 30 minutes so that students receive 60 minutes daily of mathematics instruction, 30 minutes daily of STEM enrichment instruction, and 150 minutes a week of science instruction. During the STEM Enrichment Block, all students practice applying knowledge and skills in inquiry-based learning activities using real-life scenarios. All K-5th grade students have an additional Science Lab elective class for 1 hour a week using a science engineering program. During the school year, the students in K-5th apply their knowledge in the scientific method by developing two science projects. 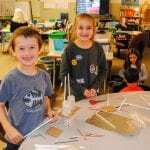 The science projects gives students the opportunities to develop, plan, and explore science as they learn through inquiry-based instruction. 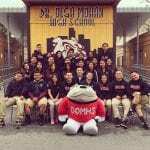 Alliance Dr. Olga Mohan High School (ADOMHS) (Los Angeles, CA). ADOMHS has prioritized its partnership with parents by appointing a Parent Engagement Specialist to interact with and encourage parent participation on campus. The Parent Engagement Specialist hosts community events (such as the monthly Town Hall Meetings) and encourages parents to volunteer at school and attend parent conferences. Counselors and administrators share and review school performance data, and provide parents with a variety of resources. The school’s college counselors and Parent Engagement Specialist design meetings to better inform parents about college entrance requirements. Topics include: high school graduation requirements, introduction to higher education, overview of the four systems of higher education in California, financial literacy, college applications and deadlines, financial aid review, and undocumented students and the CA Dream Act. In addition, the school hosts semi-annual parent conferences and informal meetings with parents to address student needs. ADOMHS encourages parents to visit and become familiar with classes and what children are learning. 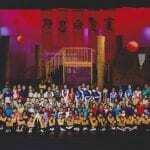 The school also encourages parents to volunteer 40 hours every year to support school efforts. The goal is that all ADOMHS parents will become more involved in the education of their child. Parents may assist with school supervision during the school day or with clerical duties in the main office, or volunteer at special events. ADOMHS informs parent and community members of upcoming events and student achievement via a monthly newsletter and phone messages. 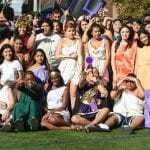 The newsletter includes messages from the administration, updates on student achievement, important deadlines, scholarship opportunities, as well as college related activities. Classical High School (Providence, RI). Teachers at Classical share a professional growth goal focused on increasing parent engagement. Every teacher sets specific, measurable, attainable, reasonable, and time bound goals to improve engagement with families. The faculty utilizes many best practice suggestions, such as establishing set office hours, providing a course syllabus, and maintaining consistent communication. The Classical Parent Association provided technical assistance in developing an increased parental web presence by including an electronic newsletter, link to teacher websites, translation options, and a Google calendar of events. In addition, the student information system, Skyward, has many parent-friendly features, including a parent portal where all families can access student assignments, review academic progress, and communicate directly with faculty and staff. Maxine L. Silva Health Magnet High School (El Paso, TX). To emphasize the importance placed on family and community engagement, the campus provides funding for a part-time Parental Engagement Leader (PEL) position. The PEL designs programs that encourage parental and community involvement. Specific activities include: creating informational newsletters, conducting or scheduling parent meetings, coordinating volunteer efforts, and procuring community donations. The PEL ensures parents are aware of and have access to the parent portal program which allows visibility of children’s grades at any time. The PEL coordinates and provides parental support and empowerment with seminars on a variety of topics, such as anti-bullying awareness. The PEL coordinates anti-bullying awareness through a series of presentations, seminars, and trainings to the community, students, and parents. This information is presented after school to allow maximum attendees. As a result, the school has reduced its discipline rate to the lowest in the district and its students have become advocates who know the procedures to follow when bullying is witnessed. The PEL also invites guest speakers such as police, emergency medical services personnel, and alumni to present on other relevant topics for parents and the community. These topics address: food bank distribution, nutrition, English acquisition, college awareness, computer literacy, health classes with an emphasis on diabetes, assistance to complete the Free Application for Federal Student Aid (FAFSA) nights, and income tax filing assistance programs.